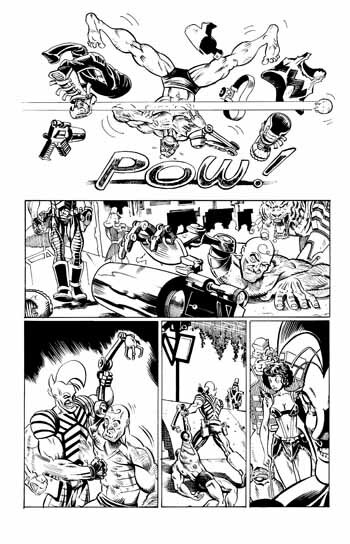 The first piece is by Jason Yungbluth and comes from his Weapon Brown comic. The second is by Steve Ellis from his and Dave Gallaher's High Moon. Both artists have very different styles on display -- Ellis is a lot more loose and seems much more raw than Yungbluth's more smooth lines. Yungbluth's work appears a lot more clean, as well. The Ellis page has many of his original pencil lines still quite visible. Although you can't see them in this scan, Yungbluth's original linework is still somewhat visible as well, but he's erased much, if not all of it, leaving only the barest hint of ghostly shadows of his thought process. It's interesting to see that Yungbluth went ahead and largely drew full figures, despite parts of them never intending to be seen. CALv1N's right arm in panel three and his face in panel five were drawn well into the margins of the page, for examples. There's also some substantial re-positioning of the figures in panel four, and Chuck's head was dramatically altered in panel three. Ellis, by contrast, doesn't change much, except perhaps to refine the quick scratchings of the explosion around the edges of the page. What you can't see here, though, is that the back side of the board features a print-out of a very rough layout sketch that Ellis had done before-hand, scanned in and printed in reverse. He would then be able to light-box the layout he liked from his initial sketches right onto the art board, allowing him to focus on the illustrations somewhat independently from the layouts. It's also fascinating to study the different inking techniques. 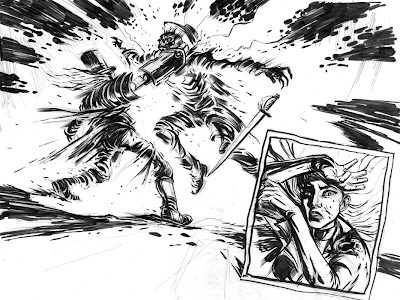 While I'm no inking expert by any means, Yungbluth's work shows a mixture of tools: brushes, ink pens, both black and white inks. Interestingly, it looks to use much of the same styles and techniques that guys like Joe Sinnott were using a half century ago. Ellis, by contrast, looks like he uses a brush almost exclusively, and rarely seems to bring out white ink. That's not to say, of course, that one style is better than another. They're just different. Different types of artists trying to tell different types of stories. But I just think all of those differences make for fascinating comparisons. And that they happen to be really cool individual pieces of art makes it that much more awesome!